The mild weather of the 2014 season continued for Rockstar Energy Racing as the series traveled to Minnesota and the Spring Creek Motocross National. However; although the temperatures were lower than normal, the humidity was still sneaky as several riders were forced to bow out due to exhaustion. They were also effected by the rough track, many uphills and downhills and more than anything, the two long whoop sections. The team was able to put together a pretty successful day despite those challenges. Jason Anderson has clearly found his groove and can win a moto at any time. The fire that made him so outstanding in Supercross has returned and is here to stay. He is now qualifying very well and finding himself contending for podiums every weekend. 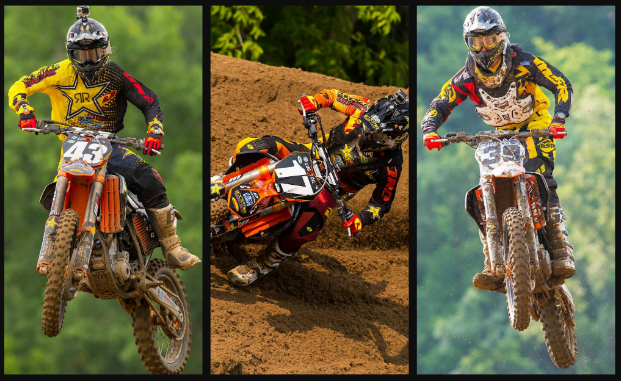 He had a little bit of bad luck in Millville but was able to shine through with very impressive rides in both motos. Anderson had a very scary moment immediately in moto 1. As the pack left the gate and accelerated down the start straight, suddenly Jason's bike could be seen flipping through the air as he tumbled with several other riders. This took place at the height of speed going into the first corner. Somehow he was unharmed but he was bike was definitely damaged. He remounted with no front brake, nearly a half of a lap behind the field and still motored all the way back to 11th. In moto 2 he started just inside the top ten and pushed forward all the way to 3rd. For much of the race he was the fastest rider on the track, nearly catching all the way up to the leaders who had pulled away early on. Jason Anderson: "My day was pretty good for the most part. I had a first turn crash and came back to 11th in moto 1, then the 2nd moto I ended up 3rd which was pretty good. I want keep that going and we should be good to go. Headed to Washougal next weekend and I love that track." Joey Savatgy had a break out day of sorts. Although this type of result is expected of the young rider, he has had some struggles since his return to racing. He has been gradually improving each week but has had some hiccups along the journey. The entire day was much improved for Joey at Spring Creek. Not only did he qualify comfortably inside the top ten, but he was also able to finish both motos in the top ten for the first time this season as well. Savatgy got off the gate well, charged with consistent lap times throughout the day and was rewarded with a solid 7th place overall. Joey Savatgy: "Today was a lot better. Qualifying went good and I put both motos together finally. I didn't crash in either of them and I got off to good starts both motos as well. 7th overall for the day is definitely good and a step in the right direction. I want to get that momentum going. I'm looking forward to next weekend and I hope we can keep this ball rolling." Ryan Sipes had a day of mixed results. In his first outing, he rode really well for 90% of the moto en route to a 13th place. It seemed that the entire pack was traveling at a similar rate of speed and nobody was making any passes. Had Ryan started further towards the front, he would have likely stayed up there as the entire race was rolling along like a freight train. In the last 3 laps, his pace clearly slowed. He started feeling extremely fatigued and just pushed himself to the end while maintaining his position. When he got back to the pits, he was struggling to not black out. He rested as much as he could during the brief time in between motos and headed back up to the line still not feeling very well. It was evident that Sipes was off his game right from the get go. He had a really tough moto and was only able to secure 17th on the day. Next week the series heads all the way back to the west coast and the hills and trees of Washougal, Washington. Anderson is particularly fond of this track and is looking for his first career overall win. Savatgy will be racing for his first time there and trying to creep closer to a top 5. Sipes will be spending the entire week in Washington preparing for the race. After having to take the week before off due to an ankle injury, he will be much more prepared heading into next weekend.